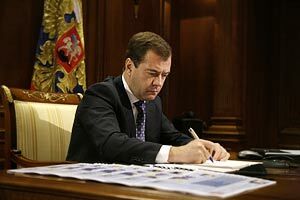 ALLRUSSIAS - Dmitry Medvedev's Article "Go Russia!" In a few months Russia will enter a new decade of the twenty-first century. Of course, important junctures and significant dates are more symbolic than practical. But they give us a reason to reflect on the past, evaluate the present, and think about the future. Think about what awaits each of us, our children, our country. First, let’s answer a simple but very serious question. Should a primitive economy based on raw materials and endemic corruption accompany us into the future? And should the inveterate habit of relying on the government, foreign countries, on some kind of comprehensive doctrine, on anything or anyone – as long as it’s not ourselves – to solve our problems do so as well? And if Russia can not relieve itself from these burdens, can it really find its own path for the future? Next year we will celebrate the sixty-fifth anniversary of Victory in the Great Patriotic War. This anniversary reminds us that our present day is the future of the heroes who won our freedom. And that the people who vanquished a cruel and very strong enemy back in those days must today overcome corruption and backwardness. To make our country both modern and viable. As the contemporary generation of Russian people, we have received a huge inheritance. Gains that were well-deserved, hard-fought and hard-earned by the persistent efforts of our predecessors. Sometimes the cost of hardships really was terrible casualties. We have a huge territory, large amounts of natural resources, solid industrial potential, an impressive list of outstanding achievements in science, technology, education and art, a glorious history regarding our army, navy, and nuclear weapons. By using its authority Russian power has played a significant -- and in some periods determinate -- role in events of historic proportions. How should we manage that legacy? How to magnify it? What will the future of Russia be for my son, for the children and grandchildren of my fellow citizens? What will be Russia’s place, and hence the place of our descendants, heirs, and future generations, among other nations in the global labour market, in the system of international relations, in global culture? What must we do to steadily improve the quality of life of Russian citizens today and in the future? To allow our society to become richer, freer, more humane and more attractive? So that Russian society can give to those who desire it a better education, an interesting job, a good income, and comfortable environment for both personal life and creative activity? I have answers to these questions. And before I turn to them, I would like to assess the current situation. The global economic crisis has shown that our affairs are far from being in the best state. Twenty years of tumultuous change has not spared our country from its humiliating dependence on raw materials. Our current economy still reflects the major flaw of the Soviet system: it largely ignores individual needs. With a few exceptions domestic business does not invent nor create the necessary things and technology that people need. We sell things that we have not produced, raw materials or imported goods. Finished products produced in Russia are largely plagued by their extremely low competitiveness. This is why production declined such much, more than in other economies, during the current crisis. This also explains excessive stock market volatility. All this proves that we did not do all we should have done in previous years. And far from all things were done correctly. The energy efficiency and productivity of most of our businesses remains shamefully low, but that is not the worst part. The trouble is that it seems that owners, directors, chief engineers and officials are not very worried about this. As a result Russia’s influence in global economic processes is, quite frankly, not as great as we would like. Of course, in the era of globalisation the influence of any country cannot be unlimited. That would even be harmful. But our country must have substantial opportunities, as befits Russia’s historic role. As a whole democratic institutions have been established and stabilised, but their quality remains far from ideal. Civil society is weak, the levels of self-organisation and self-government are low. Every year there are fewer and fewer Russians. Alcoholism, smoking, traffic accidents, the lack of availability of many medical technologies, and environmental problems take millions of lives. And the emerging rise in births has not compensated for our declining population. We managed to gather the country together to stop centrifugal tendencies. But many problems still remain, including the most acute ones. Terrorist attacks on Russia are continuing. Residents of the republics in the North Caucasus simply do not know peace. Military and law enforcement personnel are dying, as are government and municipal employees, and civilians. Of course these crimes are committed with the support of international criminal groups. But let's face up to it, the situation would not be so critical if the socio-economic development of southern Russia were more viable. To sum up, an inefficient economy, semi-Soviet social sphere, fragile democracy, negative demographic trends, and unstable Caucasus represent very big problems, even for a country such as Russia. Of course we do not need to exaggerate. Much is being done, Russia is working. It is not a half-paralyzed, half-functioning country as it was ten years ago. All social systems are operating. But this is still not enough. After all, such systems only propagate the current model, and do not develop it. They cannot change current ways of life and therefore bad habits remain. Achieving leadership by relying on oil and gas markets is impossible. We must understand and appreciate the complexity of our problems. We must frankly discuss them in order to act. In the end, commodity exchanges must not determine Russia’s fate; our own ideas about ourselves, our history and future must do so. Our intellect, honest self-assessment, strength, dignity and enterprise must be the decisive factors.